The Document is preserved at Ram Gauri Sangrahalaya Rhenock by its curator Mr. Ganesh Kumar Pradhan. For the abolition of such corrupt practice from the soil of Sikkim, pre-Congress Associations of Sikkim like Praja Sudhar Samaj party of Tashi Tshering, Rajya Praja Mandal of Kazi Lhendup Dorjee Khangsarpa and Praja Sammelan Party of Dhan Bahadur Tiwari had played a major role. 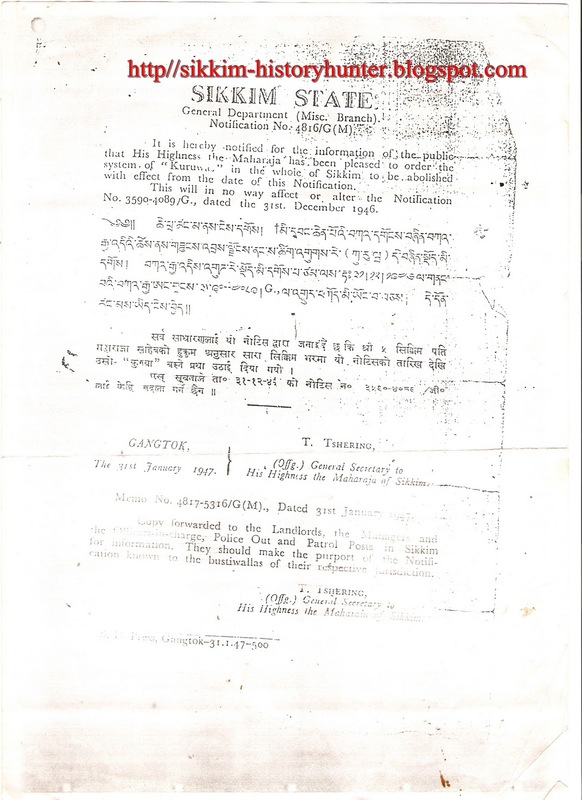 This petition also belongs to this era which was made by the peasants of Rhenock East Sikkim to the Maharaja Kumar Palden Thondup Namgyal to eradicate such an evil from the kingdom. The petition was made by late Durga Samsher Pradhan in which he has stated to His Highness Maharaj Kumar of Sikkim about the misappropriation of the Jharlangi labour by the Kazis and Thikadars for their private works. The petition was made on 24th November 1946, exactly a year before the foundation of Sikkim State Congress, the first political party of Sikkim. 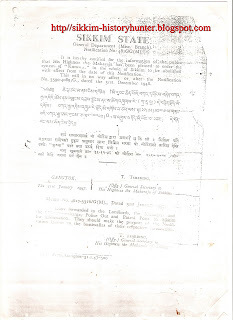 This document also gives authentic information about the taxation system prevalent in then Sikkim. A peasant had to pay Dhurikhazana (House Tax) @ Rs. 6 per annum and Bethi Tax Rs.12 per annum. It is interesting that within a month of this petition the Royal Government of Sikkim issued a notification bearing No. 3590-4089/G on 31st December 1946 which finally eradicated Jharlangi from Sikkim. The said Notification has clearly mentioned “whosoever unlawfully compels any person to labour against the will of that person shall be punished with imprisonment of either description for a term which may extend to one year, or with a fine or with both”. But, we cannot ascertain that the Jharlangi labour was abolished from Sikkim due to the petition made by the peasants of Rhenock. It was in fact a demand of every Sikkimese peasant and a cry of every entity. Being sandwiched between warring nations, Sikkim lost much of its territory to the Bhutanese invaders in 1788, to the Nepalese invaders in 1789 and was forced to cede beautiful hills of Darjeeling in 1835 to the British for their ‘selfless’ help in repelling the Gorkha invaders. The un-demarcated Sikkim-Tibet frontier also greatly suffered the sandwiched Sikkim. In 1885, British Indian Government sent Macaulay Mission to Tibet but had to abort due to the Tibetan occupation of a fort at Lingtu. For almost five years from 1885 to 1890 Sikkim had to resist pressure from both North and the South. 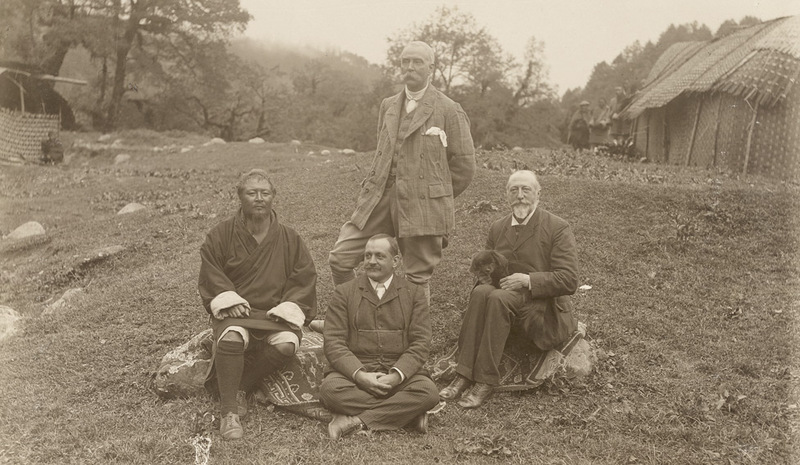 It was only after the Anglo-Chinese Convention the frontier between Sikkim and Tibet was delimited. Regarding his service in Sikkim he writes “ At the conclusion of hostilities the Government of India made a proposal that I should remain in Sikkim, with the title of Political Officer, and administer the affaires of the state in conjunction with a Council composed of the Chief Dewans, Lamas and Kazis, and of which I was to be President”. After the appointment of Mr. White as the Political Officer of Sikkim the British Government decided to remove Maharaja Thotub Namgyal and Maharani Yeshey Dolma from Sikkim to Kurseong, in Darjeeling District of British India. After their removal, Mr. White became the de-facto ruler of the Kingdom. It was during his tenure as a Political Officer Sikkim witnessed the birth of Zamindari System, Thikadari System Kalobhari, Jharlangi and Theki-bethi. 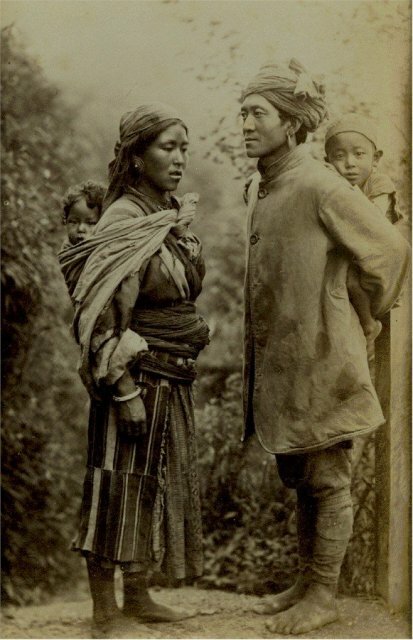 The picture is of Bhutia Coolies probably taken by some British officials in 1875. I got this vintage picture at http://oldindianphotos.in and has simply magnetized me. From the attire of the people on this picture there is no doubt to ascertain that they were the coolies who were probably working for some construction tasks initiated by the British. The most attractive thing which has dragged my attention on this picture is the Doko they are carrying on their back. Doko is a typical Nepali contrivance used by them in the earlier period to carry grass and fire wood and is now widely used not only in Nepal but in the entire Himalayan belt. To carry the said items the Bhutias used a similar type of contrivance which has a different shape. From this, it becomes clear that the picture was not taken in Sikkim, Bhutan or Tibet as the Nepalese were allowed to get into Sikkim a bit later. 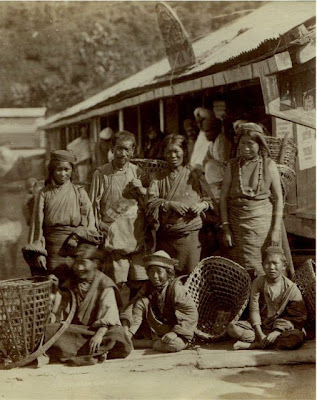 Hence, the picture of the Bhutia Coolies was possibly taken in Darjeeling and they are carrying Doko due to the influence of Nepalese in Darjeeling.